Some weeks ago, after months of not being too physically active since surgery, I finally decided to try to get into shape. This has turned out to be harder than expected. I set off on a treadmill, at a slow pace. And then slowed it down. And by 0.8 miles at an agonizingly slow pace, I finally had to give up. That was a surprising underachievement; I thought I could make at least a mile. But I kept at it, and began to get a bit better. There was a goal in mind: my son Michael, a high school junior, is running cross-country. His team, Bellevue High, has an annual invitational where they invite 20+ teams. It has an open race that anyone can run in. A few years ago, while Brian was running, Michael and I both ran. We ended up around 27 minutes for the 5k (3.1 miles), with him beating me by about 15 seconds. Things have changed in my ability to compete with him. My goal this time was to beat a 10 minute mile pace over the race. 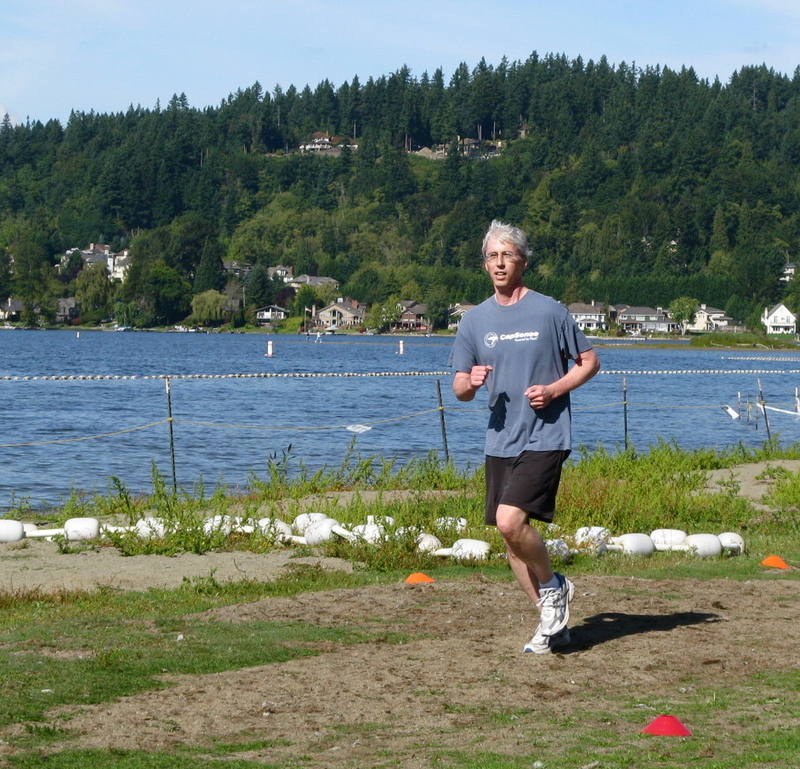 It was run at the scenic Lake Sammamish State Park, and here I am about halfway through the pace. Most of the runners were well out of sight by this point, although I’m happy to say there were a few elderly guys actually still behind me. Michael came and joined me on the last mile or so, although it was hard for him to run at my pace. He had to concentrate to go that slowly. I’m happy to say that I beat my target, finishing at 30:59. Assuming the course is exactly 3.1 miles, my average mile time was 9:59.67. Wow — I had some margin; could have gone almost third of a second slower per mile and still made it. Earlier in the day, Michael had a nice result. Among the 180 or so varsity runners, he got third. Here he is about 15 yards from the finish, running in (on) the shadow of a competitor. It’s a nice shot of their struggle to outdo each other. That guy on the right beat him by about a half step. Michael’s time was 16:03, or about 5:11 per mile. My secondary goal was to be less than double his time, which I also accomplished. One key lesson: set very low standards for yourself, and then pretend that meeting them is a great accomplishment. I claimed first in my category: runners who had brain surgery this year. That’s another lesson for success: define groups that only include yourself, and then proclaim a clear victory. I was also willing to use the excuse code that I’m on some kind of beta blocker medicine, which must have inhibited my abilities. So that’s lesson #3: create an excuse that can’t easily be proven wrong, and then make like it was an extraordinary obstacle to overcome. If you enjoy creating the illusion that you are a hero in ways no one would have guessed, these lessons may come in handy. 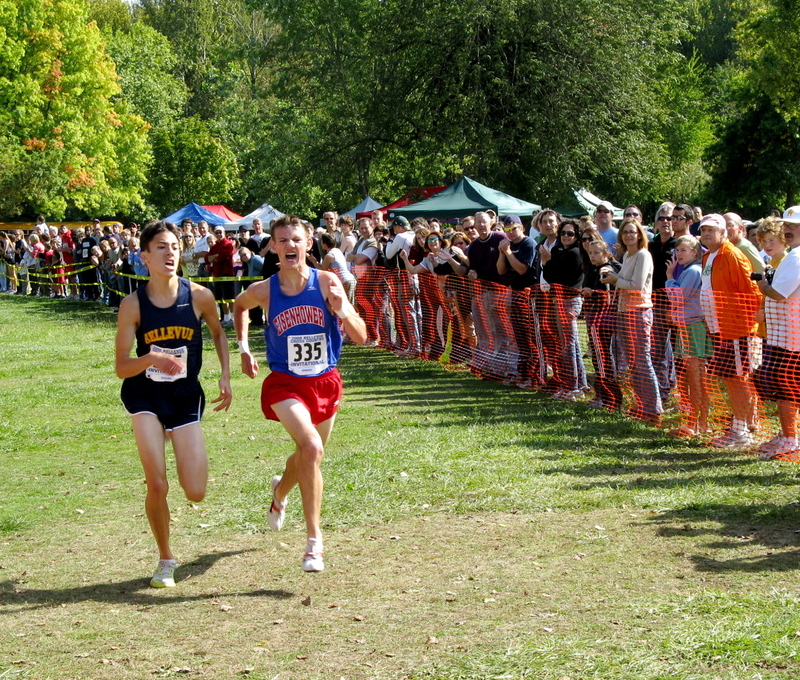 This final picture was Michael’s teammate, finishing shortly after Michael. 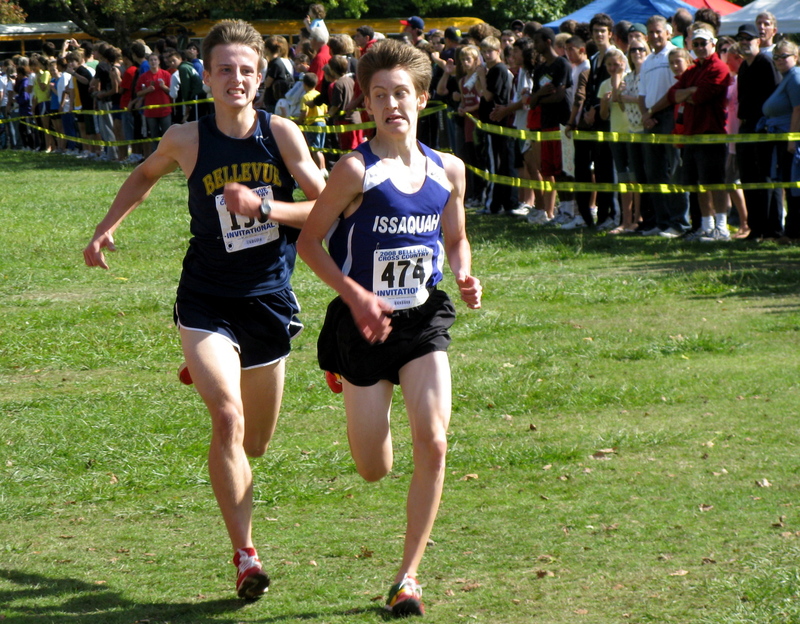 I like the expression on the Issaquah runner’s face.